"This is the Book (the Qur'an), whereof there is no doubt, a guidance to those who are Al-Muttaqun [the pious and righteous persons who fear Allah much (abstain from all kinds of sins and evil deeds which He has forbidden) and love Allah much (perform all kinds of good deeds which He has ordained)]." The Qur'an is the guiding star for mankind. We should not only recite the Qur'an, but must also understand the Qur'an and implement the Qur'an in our daily lives. We aim to provide you with a friendly reading experience and a resourceful understanding experience of the verses from the noble Qur'an. 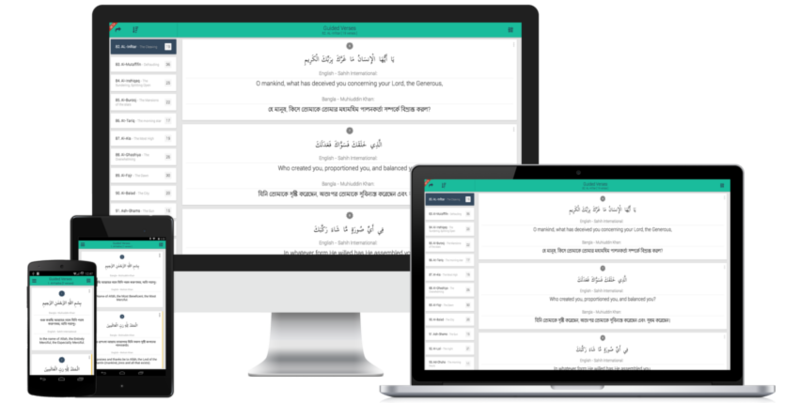 We aim to do that with support for multi-lingual translations of the Qur'anic verses, so that understanding the Qur'an is as much native to you as you desire. We aim to do that with accompanied hadith and commentaries on Qur'anic verses which provide greater clarity of the context of the revelations. We aim to do that by providing you with a diverse (yet easy) set of options & configurations with which you can enjoy a highly customizable reading experience. We aim to do that by utilizing the latest technologies of the internet in the desktop and mobile space - so that being "on the go" never holds you back. We aim to provide all of that to you - for free. Yup! It's free. Slide-in chapters pane with number of verses per chapter. Verses presented elegantly in a nice card view with any number of translation(s) you desire. 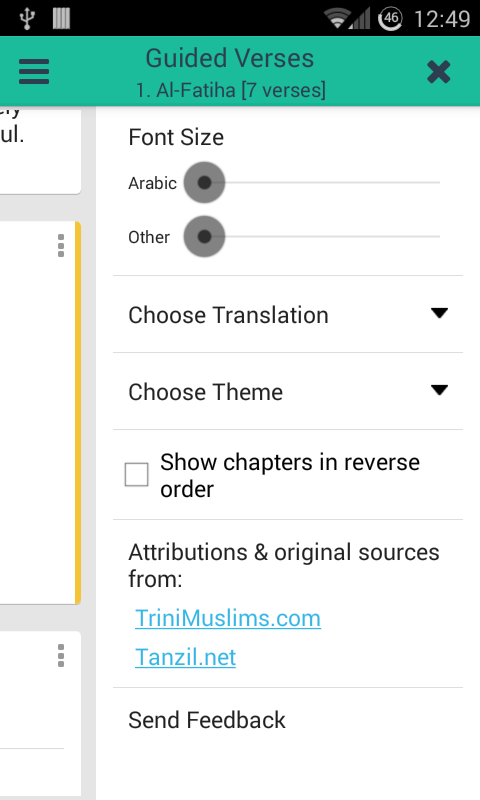 Accompanied hadith / footnotes / commentaries presented (when available) upon tapping the verse card(s). Broad choice of options & configurations to design your own user experience the way you like it. We strongly believe that knowledge and information should be accessible to anyone and everyone without charging them for their right to that information. 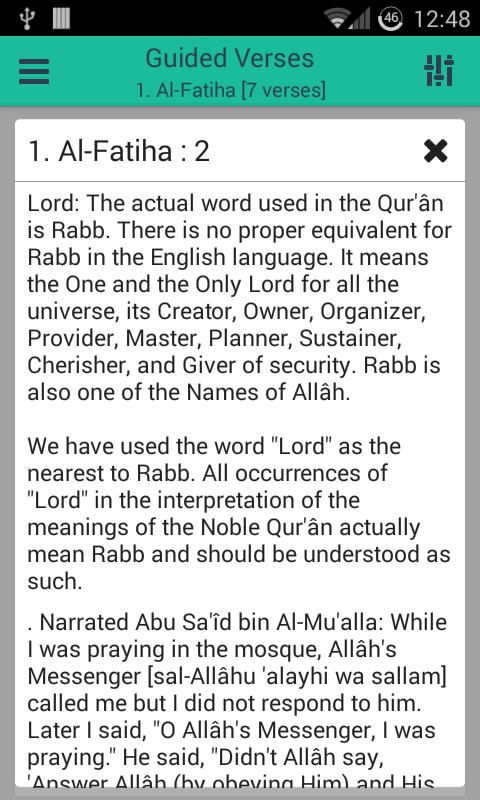 There are many qur'an apps out there in the market which require you to pay up to unlock its full features & contents. And sometimes, even if a consumer does want to pay up to recognize the efforts of the developers, they simply can't do that due to legal restrictions of off-shore payments. Hence, the consumer is left with no choice but to keep using the limited and restricted app. We have suffered from such scenarios and, hence, we want to get all such barriers away from you. Thus, it's free! Your feedback is your investment in this project. Reach out to us with feature requests, bug reports & suggestions. We are hearing.